Notes. 1. This method can only be used in the northern hemisphere. 2. You will need a clinometer or other device for measuring angles. 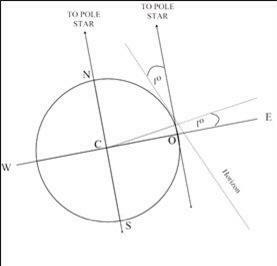 Method: Assume that the Pole Star (Polaris) is exactly in line with the Earth’s axis produced, as shown in the following diagram. To an observer O on the Equator (lat. 0o) the Pole Star will be in line with the horizon, i.e. it will have an angle of elevation or altitude of 0o. Note. 1. The Pole Star is slightly offset from the Earth’s axis but for the purposes of this exercise, we can assume that it is in line without any great loss of accuracy. 2. Because of the great distance of the Pole Star from the Earth, we can also assume reasonably that the horizon corresponds to the Earth’s axis. 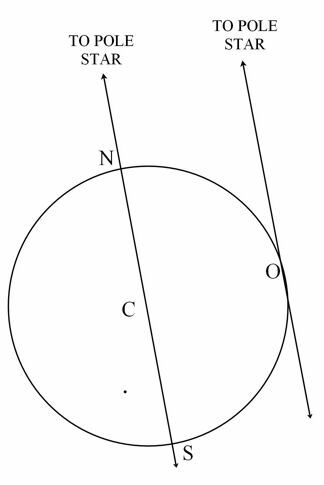 If the observer (O) were to move 60 n.m. due north from the Equator to a latitude of 1o N, then the altitude of the Pole Star will obviously increase to 1o (i.e. it will now be 1o above the horizon) as shown in the diagram below.